Step 2: confirm your spot by making the payment of the € 230 Team Fee to the account below until Friday 4th April. The total Team Fee is 230 € per team. Costs include “survival boxes” for the day (water, bananas, muesli bars and other goodies) as well as lunch snacks for the day. Individual players coming without a team pay 25€ and will receive a spot in one of the participating teams. All Fees must be paid prior to the tournament. Like every year the Playing Fields are at Purkersdorf, 8 km outside of Vienna. Organised Touch Bus: An 80 seater chartered bus will leave fromU4 subway station "Hütteldorf" at 8:15am directly to the fields (15 minutes). Cost are EUR 5 per person for both ways - cheaper and faster than public transport. Teams must reserve their spot on the bus by writing to us! 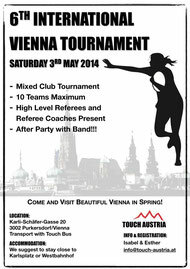 € 5 per player will be collected on the bus by one of the Vienna players. After the Tournament the Touch Bus will return directly to the After Party location “Flanagan’s Pub” at the old city center close to Karlsplatz (takes about 30min). There are 2 fields marked out, one Stadium field (70m x 50m) and one training side field (70m x 43m). There is stadium seating for the larger field and a canteen/cafe and bar behind the Stadium. Showers and changing rooms are behind the Canteen. We are very pleased to confirm the attendance of eight Level 2 and Level 3 full-time referees at our tournament. We further will have Derek Fisher as head of the referee-coaching team, as well as additional referee coaches. Our aim is to have enough full-time referees to cover all the games, however in case this isn't possible we ask you to nominate 2 player-referees from your team who could officiate at one game. We will approach you later when the draw is finished. The Touch Bus will take players directly from the playing fields to the After Party location (Flanagan’s Pub) at the old city center (Karlsplatz) - so bring your ‘party’ clothes with you. You can leave your bag in the Pub, there is a special place for it downstairs. Dinner/After-Party starts at 8pm. Order the Schnitzel or the Chicken Curry at the Pub – it’s pre-ordered only € 9-10 and will be much faster than other menu items. Most of us will go direct from the Playing Fields to the Pub.